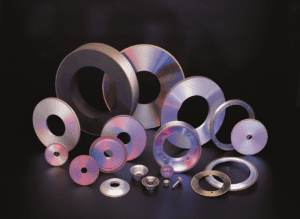 Diamond & CBN grinding wheels are the most commonly used SuperAbrasive product currently consumed. Resin bond product, as the name describes, is a combination of resins and fillers pressed under heat and pressure that are easily dressed to angle forms, straight forms, and special radius forms. The very fine finish can be achieved using resin bond products. Used for grinding most all grades of steel, but must have a hardness of 45Rc or above to be ground effectively with CBN. There are cases that soft steels are ground with CBN but many different factors will have to be addressed. HSS, A series, T series, and most stainless steels are ground effectively and profitably with CBN wheels. Used in the carbide cutting tool industry, the ceramics industry, glass industry, quarts industry, thermal spray industry and many other specialty materials. We manufacture up to 48” diameter for fine grinding, and lapping wheels with many different shapes and size pie, round pellet, and special form wheels.